Spending Your March: A To-Do List for Adventuring Through the Month. | The girl who loved to write about life. 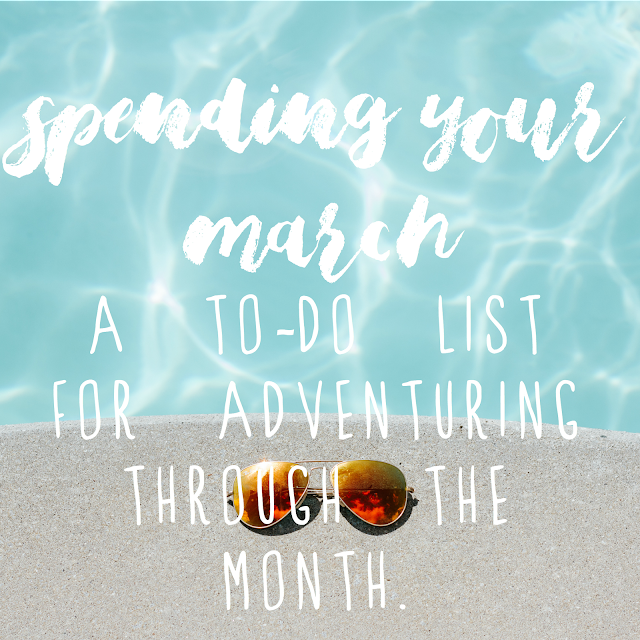 Spending Your March: A To-Do List for Adventuring Through the Month. 1. Give something up for Lent. Even if you don't officially observe Lent and the reasons behind it, it can be a good reason to go without something unhealthy for 40 days. It's easier to kick a bad habit when people all around the world are also giving things up. 2. Meet up (or facetime) with an old friend you haven't talked to in a while. 3. Set some career goals. Maybe you love your job and want to set some goals so you can continue working your way up. Maybe your career goal is to find a new job. Or to make more money from your blog so you can quit your job. Either way, if you don't spend time thinking about how to work toward what you want, you'll never get there. 5. Get a library card! There is no excuse to not do this if you like reading. FREE BOOKS. HELLO. 6. Buy some spring colored nail polish. Like this one. And this one. 7. Get rid of the winter clothes you went all season without wearing. Donate the coat you haven't worn in three years so someone else can wear it. 9. Work on making at least one night a week stress-free. Ideally more than one, but I know we all have work we do at night after our actual work is done. But try for at least one night a week where you just relax or do fun things, no cleaning or working involved. 10. Start planning a summer vacation. Whether it'll happen this summer or next summer or in ten years, planning is fun. 11. Go get ice cream. Remember when you were a kid, and going to get ice cream was a big event? Do that again. 12. Make whatever outside space you have somewhere you like to be. 13. Pay for the coffee of the person behind you. 14. Make a wish list at your library. 15. Start a workout routine and stick with it for two weeks. If you don't like it at the end of two weeks, find another one. 16. Get new sunscreen. Pool days are coming! Get rid of all your almost-empty, old sunscreens and get one you'll actually wear. 17. Celebrate St. Patrick's Day! 18. Start planning a summer stay-cation. 19. Take advantage of the time change and go for a walk after work. 20. Identify one thing in your life you need to be better at and work on it. Like actually getting up when your alarm goes off, or drinking more water. 21. Find fun drinks you like that aren't alcoholic. Alcoholic drinks are great, but when it's 2:00 on a Monday and you want something fun to drink, it's kind of frowned upon to make yourself a mojito. I've been drinking these and they are so freaking good. The grapefruit and cherry-lime are my favorites. 22. Go to the park. 23. Watch a show you've heard about but never started. Ahem, This is Us. 24. Pick one area of your house to really spring clean. 25. Try your hand at homemade ice cream. How adorable is this ice cream maker? 26. Play tourist in your own city. 27. Get a new bathing suit. And throw away your old ones that have seen better days. 28. Play a card game instead of watching TV. 29. Perfect your iced coffee making skills. 30. DIY a smoothie bowl. 31. Have a picnic. Does anything else say "springtime" as much as a picnic? How will you be spending your March?